Founded in Boulder, Colorado in 1995, Now & Zen makes Zen Alarm Clocks® and Zen Timers™ that make a real difference in people's lives. The growing preference for natural foods and natural fibers is carried forward by Now & Zen in the natural acoustic sounds and natural hardwood materials featured in every Now & Zen product. Our way of describing the essence of a natural lifestyle is "quality of thought, stillness of being." To see our products, move your mouse over the images below. Click on an image to go to its subpage. 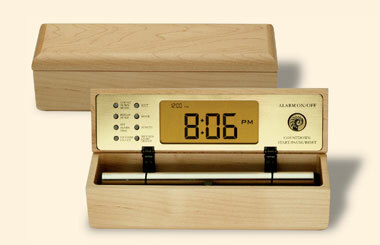 Digital Zen Clocks feature a long-resonating acoustic chime set in a hardwood box. 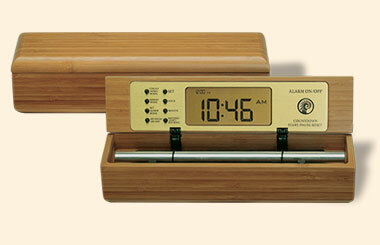 The digital interface can be programmed as an alarm clock, countdown or interval timer, and hour chime. 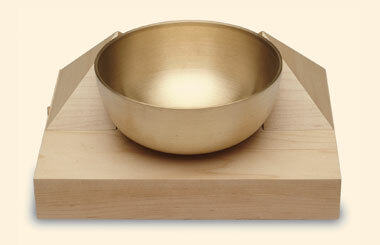 The Zen Timepiece's acoustic 6 inch brass bowl-gong fills your environment with beautifully complex tones providing an exquisite waking experience or practice timer. The world's most aesthetically sophisticated doorbell -- its acoustic brass bowl-gong fills your environment with beautifully complex tones whenever it strikes. Includes a radio-controlled wireless wood button. This product's acoustic bowl-gong replaces the noise of your telephone's ringer and also serves as an easy-to-use meditation timer. Now & Zen offers beautifully packaged gift cards that allow your friends and family to choose the exact product and style they want. Our Now & Zen products include: The Digital Zen Alarm Clock, The Zen Timepiece, and The Tibetan Phone Bell - Yoga Timers - Meditation Timers - Progressive Alarm Clock - Chime Alarm Clock - Rin Gong - Tibetan Singing Bowl - Acoustic alarm clock - Gong alarm clock.